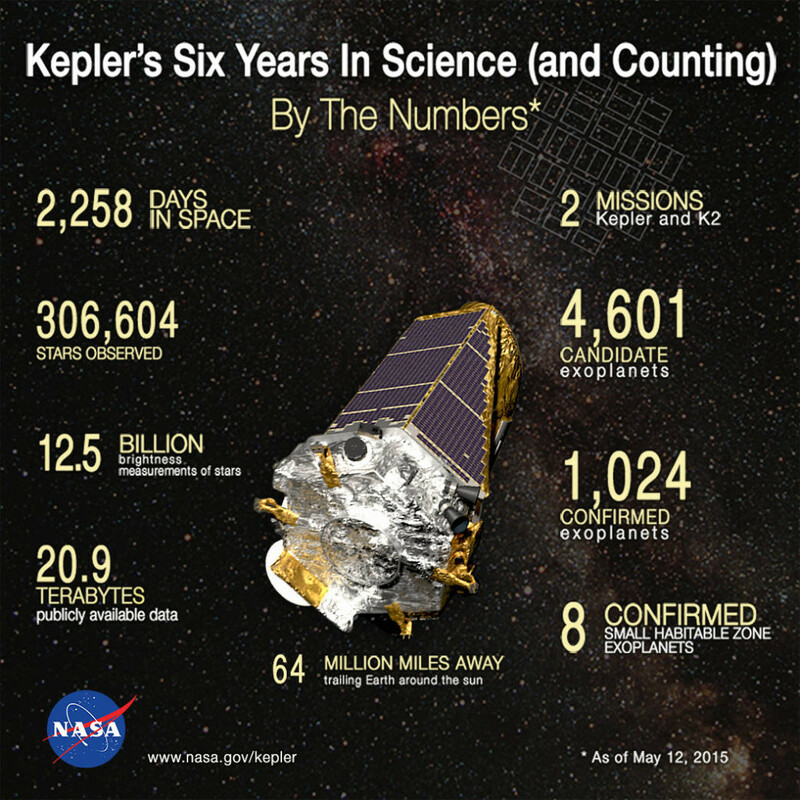 May 12, 2015 – The graphic tells NASA’s Kepler spacecraft’s story by the numbers from the moment it began hunting for planets outside our solar system on May 12, 2009. From the trove of data collected, we have learned that planets are common, that most sun-like stars have at least one planet and that nature makes planets with unimaginable diversity. Kepler launched on March 6, 2009. Its mission was to survey a portion of our galaxy to determine what fraction of stars might harbor potentially habitable, Earth-sized exoplanets or planets that orbit other stars. Of particular interest are exoplanets orbiting in the habitable zone — the range of distance from a star in which the surface temperature of an orbiting planet might sustain liquid water. For life as we know it, liquid water is a necessary ingredient. Of the more than 1,000 confirmed planets found by Kepler, eight are less than twice Earth-sized and in their stars’ habitable zone. All eight orbit stars cooler and smaller than our sun. During its four-year prime mission, Kepler simultaneously and continuously measured the brightness of more than 150,000 stars, looking for the telltale dimming that would indicate the presence of an orbiting planet. From these dimmings, or transits, and information about the parent star, researchers can determine a planet’s size (radius), the time it takes to orbit its star and the amount of energy received from the host star. Kepler’s exquisitely precise photometer, or light sensor, was designed to detect minute changes in brightness, to infer the presence of an Earth-sized planet. For a remote observer, Earth transiting the sun would dim its light by less than 1/100th of one percent, or the equivalent of the amount of light blocked by a gnat crawling across a car’s headlight viewed from several miles away. In May 2014, the Kepler spacecraft began a new mission, K2, to observe parts of the sky along the ecliptic plane, the orbital path of the Earth about the sun, where the familiar constellations of the zodiac lie. This new mission provides scientists with an opportunity to search for even more exoplanets, as well as opportunities to observe notable star clusters, young and old stars, active galaxies and supernovae. The spacecraft continues to collect data in its new mission. Ball Aerospace of Boulder, Colorado was the prime contractor for NASA’s Kepler Mission. Ball designed and built the Kepler spacecraft, which includes the sensitive photometer used to find planets and operates Kepler for NASA. NASA Ames Research Center is responsible for Kepler’s mission concept, ground system development, science data analysis and K2 mission operations. NASA’s Jet Propulsion Laboratory in Pasadena, California, managed Kepler mission development. Ball Aerospace developed the Kepler flight system and supports mission operations with the Laboratory for Atmospheric and Space Physics at the University of Colorado in Boulder. The Space Telescope Science Institute in Baltimore archives, hosts and distributes Kepler science data.